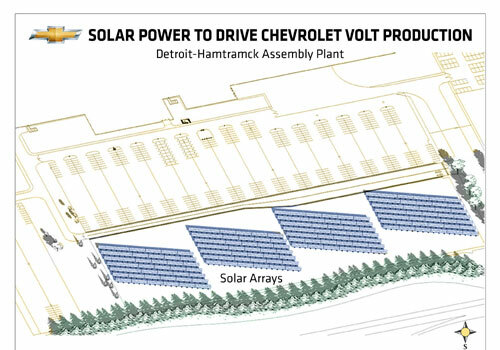 General Motors Detroit-Hamtramck plant will be equipped with leading photovoltaic solar array that will convert the sunlight into electricity in order to provide power to the house of Chevrolet Volt. General Motors is among the most important consumers of renewable energy in the industrialized sector, it derives energy for mechanized maneuvers from solar, hydro, and landfill gas resources. In the US almost 1.4 percent of GM energy utilization is managed from renewable resources. GM and DTE unveiled this project on Wednesday 11th of May 2011; electricity that will be generated by this 516KW project will charge 150 electric cars daily for a year. It is expected that this project will be completed in this summer. GM has selected the Detroit-Hamtramck for this project because it is more spacious for the array and secondly it is the home of Chevrolet Volt electric cars. DTE has invested US $ 3million in this array and the Detroit-Hamtramck mechanism is the division of Solar Currents energy of DTE. DTE energy and General Motors ahs planned to construct the array on land of 6-acre situated on the south side of plant. Trevor Lauer, Detroit Edison vice president said, “Our partnership with GM is another example of how our companies work to build a more energy-efficient and sustainable future, our Solar Currents program was designed to increase the demand for renewable technologies in Michigan, and it is our hope that installations like this one do exactly that.” The array will also be helpful for the other activities at the plant and will also reduce the overall energy cost. This project is a step forward to protect the green environment as well as better utilization of natural resources.